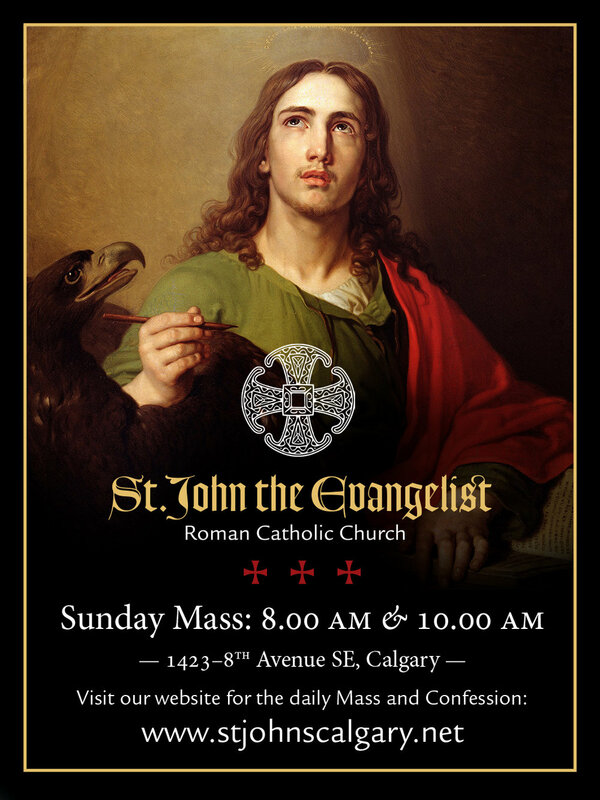 St. John the Evangelist, Calgary, is a traditional Roman Catholic parish of the Personal Ordinariate of the Chair of St. Peter where we make a special welcome to Anglicans who are seeking to come home to the Catholic Church. Our Parish Priest is Father Robert-Charles Bengry GSmp and our Parochial Vicar is Father Sean-Patrick Beahen GSmp. Both are Gilbertine Fathers of the Canons Regular of St. Gilbert of Sempringham. For 106 years we were a parish of the Anglican Diocese of Calgary but were received into the full communion of the Roman Catholic Church on 18 December 2011 as a response to Pope Benedict XVI Apostolic Constitution Anglicanorum coetibus. We were canonically erected as one of the founding parishes of the Personal Ordinariate of the Chair of St Peter on 4 November 2014. We are a family-friendly community where God the Holy Trinity is worshipped in the beauty of holiness. St. John’s is both a neighbourhood and a destination parish where the Catholic faith is passed on faithfully to this new generation. We seek, as a Catholic family, to grow together in holiness in the love of God and neighbour. St. John’s century-old commitment to serving the people of Inglewood and the wider city of Calgary remains as firm as ever. Come and visit us and join our thriving community for worship, fellowship and good works. Medicine for Malawi: Malawi is one of the poorest countries in Africa. Many Malawians live on less than 10 cents/day and an average professional wage is $70/month. For over 15 years, St. John the Evangelist has exchanged visits and worked with Anglo-Catholic parishes there, providing aid for drought, and flood victims, school building repairs and supplies, medicines and clean drinking water by introducing biosand water filters. In May, Gwyneth and Richard Harding are travelling to Malawi to visit Canon Raphael Mponda. With the support of Fr. Bengry, we are looking to raise $675. to bring a Humanitarian Medical Kit through Health Partners International containing over $5,000 of the most desperately needed medicines. Your support can go a long way to relieve the pain and suffering of many. If you would like to donate or have questions, contact Gwyneth or Richard. Unfortunately, St. John’s does not have CRA approval to provide tax receipts for donations, at this time. 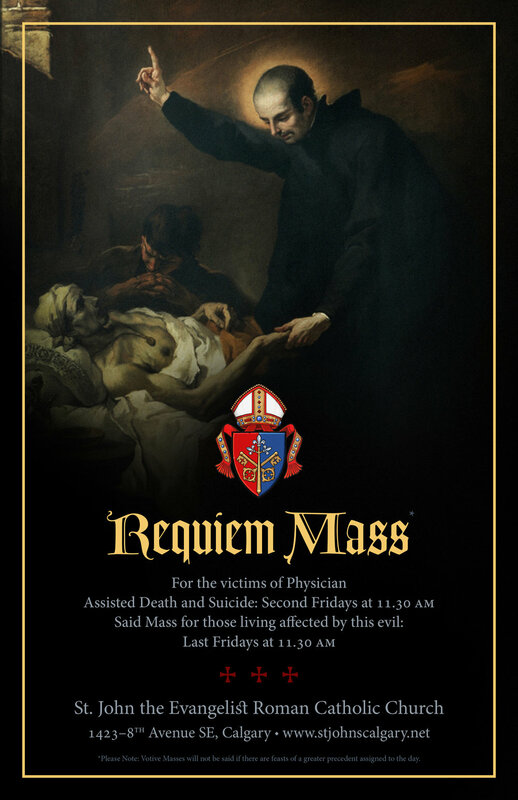 Please note: Pastoral Care, Sacramental Enquiries and Mass Intentions: We ask to be informed immediately of those who are sick in hospital or at home in order that appropriate pastoral arrangements can be made. For these concerns, Sacramental Enquiries and Mass Intentions please call the church office: (403.265.5072) or email our Parish Secretary Mrs. Susan Travis: (secretary@calgaryordinariate.com). Mass is normally celebrated every day at St. John’s but there are interruptions from time to time. Below is this week’s schedule. Click [here] for our ordinary schedule. Please forward Mass intentions to Mrs. Susan Travis, our Parish Secretary, at 403.265.5072 or by email: secretary@calgaryordinariate.com. The suggested donation is $10. We have a number of opportunities (as scheduled or by appointment) to partake of this life-giving sacrament at St. John’s. If the purple stole is hanging outside of the confessional, it means a Priest is not currently in — if it’s not there, it means a priest is inside waiting to hear confessions and absolve sins. If it’s been a long time since you’ve been to confession, the priest will guide you through the process. The seal of the confessional is absolute: draw near to God, confess your sins, and experience the salvation that God’s peace brings. Gilbertines pray the Daily Office, including Morning and Evening Prayer, which are normally prayed publicly in the Church. All are welcome to join in. Compline and the Little Hours (Terce, Sext and None) are also said at the Church, though less regularly. If you happen to be in the area, come and pray. Because our group is small, from time to time prayers may not take place as scheduled—please accept our apologies. Holy Baptism is the basis of the whole Christian life, the gateway to life in the Spirit, and the door which gives access to the other sacraments. Through water and the Holy Spirit, men and women are freed from the power of sin and death and are reborn as sons of God and members of Christ's body, the Church. Find out more about baptism at St. John’s [here]. Those who have been baptised continue on the path of Christian initiation through the Sacrament of Confirmation. In this sacrament they receive the Holy Spirit whom the Lord sent upon the apostles on Pentecost. Find out more [here]. We at St. John’s make a special welcome to Anglicans who feel called home to the Catholic Church. The decision to get married is one of the most significant steps in a person’s life. Perhaps it is the most significant: two people make vows to each other to remain exclusively together for the rest of their lives. St. John’s is a beautiful place to be married, find out more [here]. Are you a Catholic man who feels a call to the Priesthood? Have others told you that you'd make a good Priest or Deacon? Are you unsure how to even start exploring a sense of call? If so, contact Fr. Robert-Charles Bengry or Fr. Sean-Patrick Beahen and he will point you in the right direction. Contact him through our parish secretary [secretary@calgaryordinariate.com]. The anointing of the sick is done by a Priest to bring spiritual and even physical strength and healing during a serious illness, especially near the time of death. In the case of an emergency call our Priests, Fr. Robert-Charles Bengry or Fr. Sean-Patrick Beahen at: 403.764.6827. Death is a consequence of original sin — if we had not sinned then our bodies would go straight to heaven, as our Lord did in his Ascension, and Our Lady did at her Assumption. However, since Christ has conquered death on the Cross, our sorrow is tempered by the hope of the Resurrection. We trust that on the last day our mortal bodies will rise again to be with Our Lord. Find out more about Catholic funerals at St. John’s [here]. Mrs. Susan Travis is our Parish Secretary. She is normally in the office at Cross Hall on Mondays and Thursdays from 9.00 am to 3.00 pm. The doors are often locked for security purposes, please ring the door-bell to the right of the doors. You can call us at: 403.265.5072 or if there is a pastoral emergency call: 403.764.6827. St John’s is easily accessible from either Deerfoot Trail (Highway 2) via Blackfoot Trail SE and 17th Avenue SE (1A) from downtown along 9th Avenue SE. We are located one block north of 9th Avenue SE, and two blocks east of the Zoo Road NE turnoff to the bridge. St. John’s office hours are normally on Mondays and Thursdays from 9.00 am to 3.00 pm. All rights reserved. Webmaster: Robert Shipley.